busybox-w32 is a port of BusyBox to the Microsoft Windows WIN32 API. It brings a subset of the functionality of BusyBox to Windows in a single self-contained native executable. 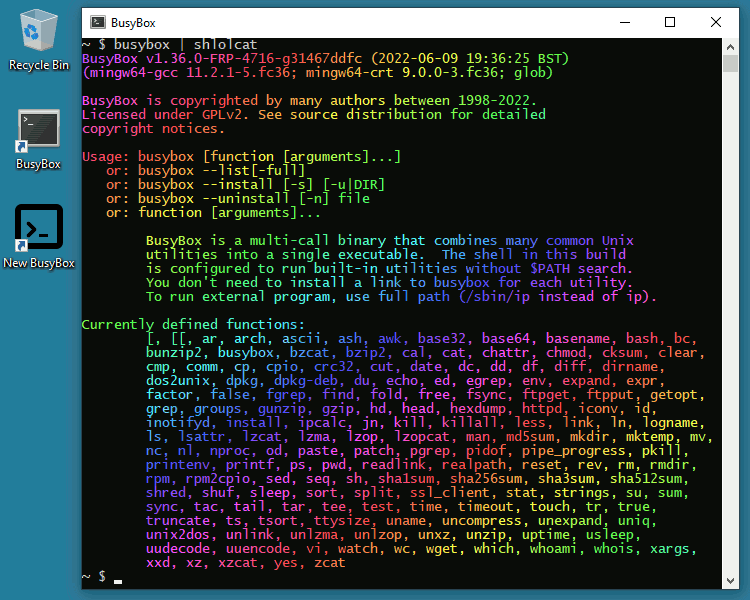 The BusyBox shell is based on ash. It strives to be POSIX-compatible, though it does support some features of bash. A UNIX-style shell is something like the Windows command prompt, though much more powerful. It can be used as an interactive command line or to run shell scripts (like Windows batch files, though again, much more powerful). awk is a scripting language with a particular emphasis on pattern matching. It's commonly used to process text files containing rows and columns of data. sed is a stream editor. It can be used to make automatic, non-interactive changes to text files. vi is a powerful visual editor. If you're already familiar with vi you'll know what to expect. If not you should be aware that it's not particularly intuitive: you need to learn how to use vi. Try this BusyBox vi tutorial. Other staples of Unix shell programming, such as find and grep are also available. Most of the commands have a --help option that displays a brief description and documents the available options. If you need the full power of bash or the other GNU utilities busybox-w32 may not be what you want: Cygwin , Gow or UnxUtils may be more suitable. However, if you need to ship some shell scripts with your software or if you need to run a Unix build script busybox-w32 may be a compact alternative. The full executable is less than half the size of the Cygwin setup program! The last character there is a lowercase 'L' (for login). Omitting the directory will result in the links being made in the same directory as the busybox.exe executable you're running. The --install option creates 'hard' links which are available on NTFS filesystems but not FAT. displays the links to the binary without deleting them. If you want to install a 32-bit build of BusyBox in a system directory on a 64-bit Windows system you should put it in C:\Windows\SysWOW64, which is the correct location for 32-bit binaries on 64-bit Windows. Putting it in C:\Windows\System32 will result in mysterious failures. From time to time binary builds and source tarballs will be made available. The latest version is always busybox.exe (currently this is an alias for busybox-w32-FRP-3025-gc01300361.exe). Release notes for this version are available. This key has been used to generate the PGP signature file busybox.exe.sig. Older binaries and the source corresponding to each binary are kept here. Old versions will be deleted about three years after release. Sometimes stupid antivirus software complains about busybox.exe. If this is a problem you can try downloading a different version. frippery.org isn't part of your build infrastructure and comes with no Service Level Agreement. a WIN32 su applet is available. It runs a shell with elevated privileges ('as Administrator'). the readlink and dpkg applets are enabled by default. a WIN32 implementation of iconv (which is not present in upstream BusyBox) has been added. the output of the ps applet has been improved. It now displays the full command line of other running instances of BusyBox. files with the extension .sh are treated as executable scripts. If they don't start with a #! line to specify an interpreter they're assumed to be shell scripts. As before, text files starting with a #! line are considered to be executable scripts, even if they don't have an extension. the realpath applet is enabled by default. the ttysize applet is enabled by default. It reports the size of the console window. The binaries are built using the MinGW-w64 toolchain on Fedora and are tested on Microsoft Windows 8.1 and 10. busybox-w32 also works on Windows XP and on ReactOS, though with reduced functionality. Bug reports can be submitted via GitHub, GitLab or by email to the address below.